Saturday morning we finished packing our bags and one of our Rising Star drivers, Sankar, picked us up from our apartment. Rising Star had planned a fun morning for us at the zoo after our week of hard work with them. Sankar drove us to the Arignar Anna Animal Park in Chennai. 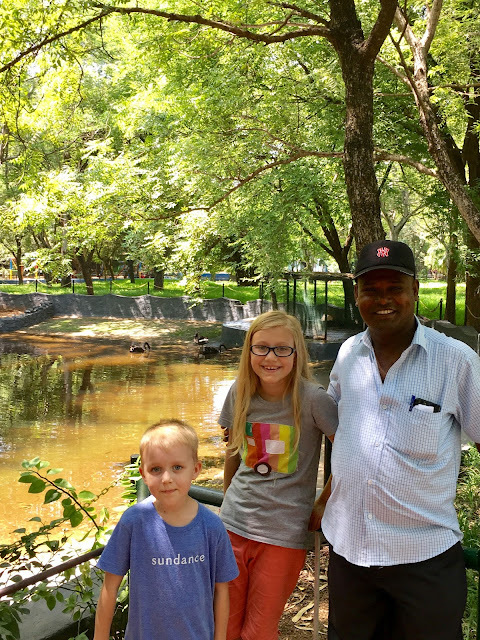 We have been to the zoo many times, but it was a whole different experience in Chennai. For starters, we got tickets for the jeep safari. It basically meant we had a whole little tram to ourselves that drove us to each animal exhibit. Considering that it was hot and humid, this made the whole crew much happier touring the park. Secondly, at this zoo the animals were actually active! Usually at the zoos in the US, if you look carefully you can see the big cats laying around in the back of their exhibit. At this park, all the big cats were roaming through their cages, putting on a show for us. They are such beautiful creatures. Emma, Ethan, and Henry with the tigers. They were only three feet away from us! And lastly, we saw black swans. Definitely none of those in America! interesting Hindu sculpture at the zoo. Dinner. The kids were a little shocked by this. Someone has a sense of humor! We were so hot at the zoo, we decided to get ice cream. but luckily no one did! When we had finished at the zoo we drove back to our hotel in Chennai. One of Elliott's coworkers is from Chennai originally, and her parents still live there. They were so kind and invited us to a lovely dinner. The food was amazing. Unfortunately our kids still were not fans of Indian food, but Elliott and I were spoiled by the smells and flavors. I wish I had gotten some pictures. It was lovely to be in their home and experience more of the culture of this beautiful country. 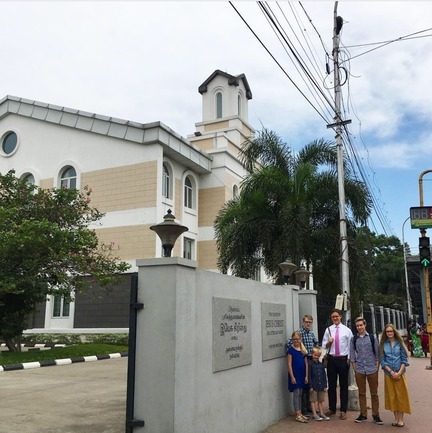 The next day was Sunday, and although we had an afternoon flight to Delhi, there was plenty of time for us to go to the LDS church ward that meets in Chennai. There were quite a few of our friends from Rising Star at the church, which is a long drive (2 hours?) each way from the school. We were hoping to share an actual Sacrament meeting with the people there, but they were showing General Conference, so we watched a few talks and then went to catch our plane. The best seatmates I could have on the flight to Delhi! Finally, we arrived at the airport in Dehli. It only took us an hour to get our luggage this time, and we were so, so happy to arrive at this luxurious destination were we would be spending the next three weeks! Lobby of our hotel in Gurgaon, outside Delhi.